The application window to become a campus rep is currently closed! Check back December 2015! Victoria’s Secret PINK is a fully-articulated lifestyle brand that college-aged women across the nation have grown to love! The vibrant and fun apparel line is marked by bright colors and bold graphics that can always be spotted on college campuses. In 2008, Victoria’s Secret PINK further solidified its collegiate heritage with the launch of the PINK Collegiate Collection, an exclusive assortment of co-branded merchandise that features VS PINK’s highly recognizable iconography and the names and logos of the top universities. In order to continue its connection with the target audience, young college women, PINK created the Campus Representative program – an exclusive on-campus internship opportunity to gain real-life event planning, marketing, and advertising experience from a world-renowned fashion brand. 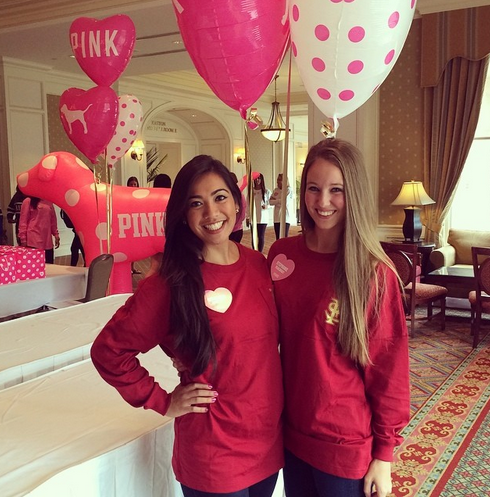 For the 2016-2017 school year, 2 Campus Reps at over 100 colleges and universities around the United States will be selected to represent PINK on their campuses. Plan and execute PINK events on campus Utilize social media outlets to raise PINK awareness on campus and throughout the local community Execute and promote a philanthropic project Communicate daily on http://www.vspinkoncampus.com (a secure intranet site for Campus Reps only) through messages/blogs/phone calls with your PINK supervisor Work closely with your local Victoria’s Secret PINK store to generate store traffic Complete PINK related weekly surveys that give insight as to what is happening on your campus Establish sustainable relationships with on campus figures such as Licensing Directors, student group executive boards, etc.